Jews living in Islamic countries - notably Spain and Portugal - were having a less traumatic time and, despite brief interludes of persecution, led a relatively stable and prosperous existence. Jews were able to rise to high office and Jewish culture flourished. In the early 1970's the late Rabbi David Goldstein edited a marvellous book of Jewish Sephardi poetry called, 'The Jewish Poets of Spain' published by Penguin. If you ever see a copy for sale my advice is to grab it before I do! The word 'Sephardi' refers to Jews of Spanish/Portuguese origin. When the Christian reconquest of Spain and Portugal was completed in the 15th Century, Jews and Muslims were subjected to the gentle hands of the Roman Catholic Church via the Office of the Inquisition. Methods such as torture and burning alive were used to convert non believers to Roman Catholicism. In 1492 King Ferdinand and Queen Isabella of Spain ordered the expulsion of Jews and Muslims from their lands. Portugal followed a few years later. Some 'secret' Jews (Marranos) remained in Catholic Europe, but were subject always to the terror of discovery by the Roman Catholic Inquisition. Oliver Cromwell permitted Jews to return to England in 1655. Oliver Cromwell was a pious Christian. These were Sephardic Jews and they came mainly from Holland. The 1st Synagogue to be established after the readmission was Sephardi. It was established in the city of London in 1657. When this synagogue became too small, Bevis Marks synagogue was built. Construction took place in 1701 in the City of London. Bevis Marks is still there and well worth a visit. Jews from Central Europe (Ashkenazi) arrived some decades later. These immigrants were mostly traders and bankers. The first Ashkenazi Synagogue (The Great Synagogue at Dukes Place) was built in 1720 in the City of London. Dukes Place Synagogue was bombed and destroyed in World War 2. The word 'Ashkenazi' refers to Jews of Germanic origin. In 1870 the United Synagogue' was founded. The 'United Synagogue' of Orthodox synagogues largely represented the established UK Ashkenazi Jewish population. "....it is difficult for Jewish Immigrants to support themselves and their households, and at times they contravene the will of their Maker on account of poverty and overwork, and violate the Sabbath and Festivals. Some have been ensnared in the net of the missionaries and renounced their religion, may the Merciful save. There are many who believe that all the cobblestones of London are precious stones, and that it is a place of gold. Woe and alas, it is not so... I implore every rabbi of a community kindly to preach in the synagogue and house of study, to publicise the evil which is befalling our brethren who have come here, and to warn them not to come to the land of Britain, for such ascent is a descent." Likewise, the new Eastern European Jewish immigrants felt uneasy with their Anglicized 'United Synagogue' co-religionists and founded their own separate synagogues in London's East End. These synagogues were so numerous that nearly every street in the Whitechapel/Aldgate/Mile End area had at least one - and frequently more than one - synagogue residing in it. In 1887 Many of these 'steibls' and 'chevras' (small communities) united together under the umbrella of a new organisation called the 'Federation of Minor Synagogues'. The Federation was founded by the energy, vision and foresight of banker and MP Samuel Montagu (the 1st Lord Swaythling). His daughter - Lily Montagu - went on to become one of the founders of the Union of Liberal and Progressive Synagogues (ULPS - now called 'Liberal Judaism'). Most of handful of Orthodox synagogues remaining in the East End are still members of - or are affiliated to - the 'Federation'. On arriving in the UK most settled in the port cities where their ships docked. The East End of London received most of the new arrivals. By 1914 there were approx 150,000 Jews living in the Whitechapel/Aldgate area. More Jews arrived in the 1930's as refugees from the Nazis. By the end of the 20th century most Jews had left the East End to settle in the leafy suburbs. Theresienstadt was presented to the World as a model prison camp. The Nazis produced a propaganda film called 'The Gift of the Town' which purported to show Jews leading happy lives under benevolent Nazi rule. A fragment of this film survived the War and the video can be purchased in the Theresienstadt Holocaust memorial museum. 2005 update - this 'derelict' synagogue is now a very smart cafe, which is a good excuse for walking into their courtyard for a better look at the premises! Doheny Street Synagogue in Budapest, Hungary. Doheny Street is the largest Synagogue in Europe and seats 3000. It was neglected under the Communists and is currently undergoing restoration. Jewish life is thriving once again in Hungary where there are said to be around 100,000 Jews. The founder of modern Zionism Theodore Herzl lived close by. Theodre Herzl was an assimilated Jew working as a journalist who reported on the Dreyfus treason trial in France. He was so shocked at the anti-semitism he witnessed that he felt Jews could only ever live a free life if they had their own country. This led him to found the Zionist movement. Interior view looking towards the ark showing one side of the raised ladies' gallery. The interior is breathtakingly beautiful. Memorial to Raoul Wallenberg in the grounds of Doheny Street Synagogue in Budapest. Raoul Wallenberg was a Swedish diplomat in Budapest during World War 2. He issued Swedish visas to Jewish refugees and was responsible for saving 35,000 Jews from the Nazis. At the end of the War he was taken prisoner by occupying Russian forces and is presumed to have been murdered by them. Memorial to Holocaust victims in grounds of Doheny Street Synagogue. Hungarian born actor Tony Curtis was largely responsible for financing this memorial and the on going restoration of Doheny Street Synagogue. 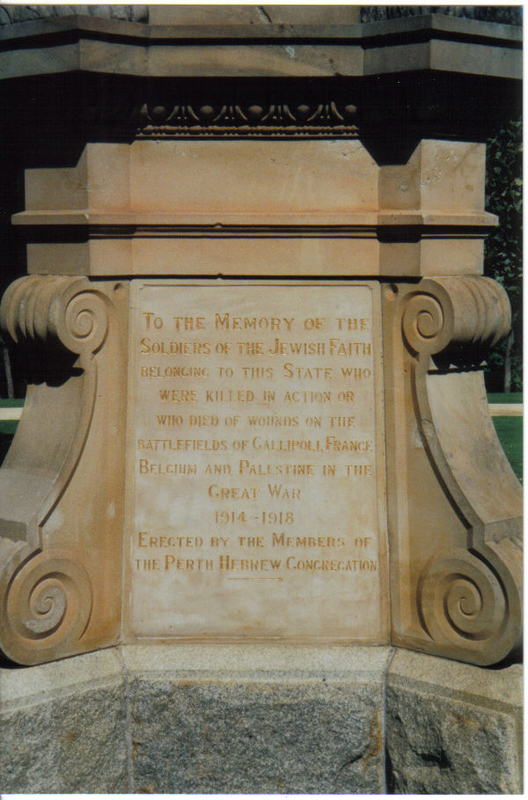 The inscription reads: "To the memory of the soldiers of the Jewish Faith belonging to this state who were killed in action or who died of wounds on the battlefields of Gallipoli, France, Belgium and Palestine in the Great War 1914-1918. Erected by the members of the Perth Hebrew Congregation"
December 2003: Of all the sad sites I have seen on my travels the saddest have been the German Cemeteries of World War One. It is well known that British & Commonwealth War Cemeteries follow the line of the Western Front for hundreds of miles South from the Channel ports. Less well known are the German WW1 cemeteries that line the same tragic route. On a recent visit to Bethune I was driving South on the road to Arras when I spotted a small sign marking the entrance to a German World War One Cemetery at Neuville St Vaast. Curiosity overcame me and rather self-consciously I parked my car and walked into the grounds. Inside, stark black crosses stretched to the horizon. There were no flowers, no wreaths, no poppies, no adornment of any kind, and no visitors other than myself. Each cross marked the grave of 4 German soldiers. Interspersed amongst the crosses were occasional oblong headstones. Each headstone was marked with a Star of David and the name of a Jewish soldier who died fighting for Germany. A generation later their compatriots would have put them in the gas chambers. I placed a stone on the nearest Jewish headstone and left.